Khartoum — SUDAN has revoked the accreditation of at least six journalists working for international news outlets covering demonstrations against President Omar al-Bashir. Journalists working for media outlets based in Qatar and Turkey had their credentials revoked. Al-Bashir is under pressure to quit after the deteriorating economic and political crises blamed on his administration. Media rights groups denounced the latest clampdown on media by the beleaguered government. 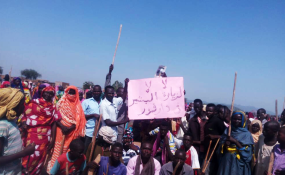 "Sudan's move against the international media is another desperate attempt to muzzle the press during this period of unrest," said Sherif Mansour, North Africa Coordinator for the Committee to Protect Journalists. Bashir was due to travel to Qatar on Wednesday (today) for his first international trip since the protests began in December. Several local journalists have been arrested covering the demonstrations. An estimated 40 people have been killed during government's brutal response to protests emanating from the increases in bread and fuel prices. The value of the Sudanese pound has fallen in value. Critics accuse al-Bashir (75) of mismanaging the oil and agro-based economy. He has been in power since 1989 when he led a military coup that ousted the democratically elected government of Prime Minister, Sadiq al-Mahdi. The International Criminal Court (ICC) in 2008 issued a warrant of al-Bashir's arrest for alleged individual criminal responsibility for genocide and war crimes in Darfur since 2003.